Last Spring, a friend generously gave me the brilliant idea to design a dinosaur. That idea kicked around in my head for a while, and a few months later I drew up a sketch of how I wanted it to look. In the sketch I included a variation for a dragon, and that thought was so inspiring I went out and bought yarn before the end of the week! I found the perfect yarn: brilliant colours, soft to the touch, with just a little sparkle. Within a few days I had the body all knit, and was eager to start on the rest... but then the heat of summer set in. By the end of a busy day playing with the kids, I just wasn't interested in picking up something woolly and using my brain. We got home from visiting family at the beginning of September, and as soon as the kids were off at preschool, I started working again after a much-longer-than-expected break. I decided to go with a simple pattern to ease myself back in. The Baby Orangutan was something I'd worked on a long time ago, and just needed a few adjustments and an accessory to finish it up. While I was happy with it, I wanted more of a challenge for my next design. I had a brilliant idea one day during a yoga class (yes, my mind was wandering, but you can't always help that)! I enlisted a friend's help with smoothing out the design and picking colours, found some yarn to knit a sample, and eagerly picked up my knitting needles... Only to fizzle out after a week, when I realized I'd messed up the first part and would have to pull it all out. I took some photos, my husband worked his usual magic with the ever-temperamental publishing software, and, "Ta da!" 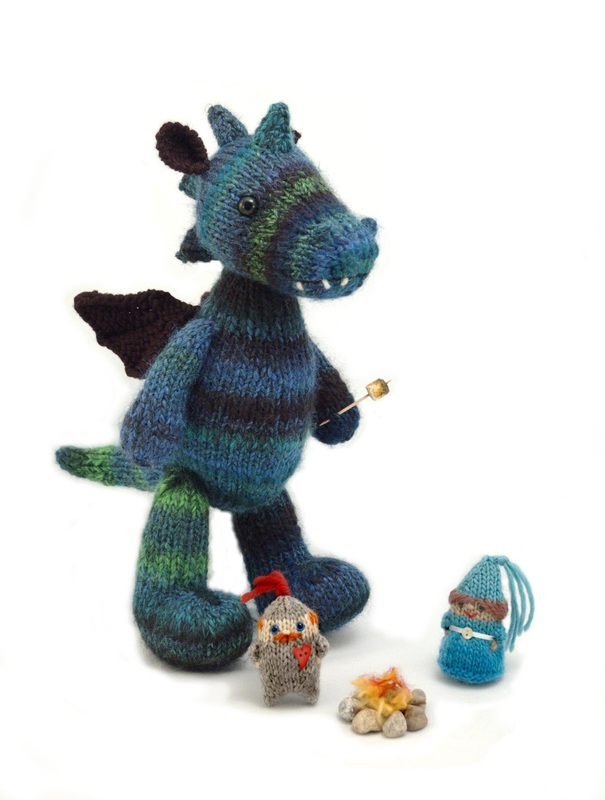 So, much sooner than I planned, and with a very happy heart, here are the Dragon and his wee friends. Find it on Ravelry or Craftsy. Knit some cuteness! Posted by Barbara Prime at 9:44 a.m.
Hah! I didn't notice his marshmallow before! November 1, 2012 at 10:00 a.m. Very very cute. Congratulations. Your props are quite outstanding. November 1, 2012 at 11:13 a.m.
November 1, 2012 at 11:28 a.m.
OHMYGOSH I love it...My daughter has several birthday parties to attend in the next month and I know I am making this for gifts! November 1, 2012 at 11:38 a.m. This is wonderful! All three of them! Great Job!! November 1, 2012 at 12:06 p.m.
November 1, 2012 at 1:01 p.m.
November 16, 2012 at 7:30 p.m.